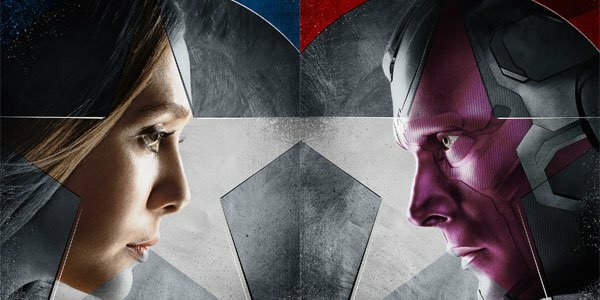 There are many great relationships and dynamics that get a very special spotlight in Joe and Anthony Russo’s Captain America: Civil War, but certainly one of the most exciting bonds is between Paul Bettany’s Vision and Elizabeth Olsen’s Wanda Maximoff/Scarlet Witch. Circumstances in the plot (which I won’t spoil here) lead these two characters to spend a significant amount of time with each other in the movie, but there is also the sense delivered that they have grown closer together than with the rest of their Avengers teammates. It’s some of the best characterization in the film, and the reason why it works so well, according to Paul Bettany, is because of their shared "youth" in the superhero world. I think they both don’t know the extent of their powers, and that’s frightening. Vision has just recently been born, and she has recently received this gift. And not knowing, like a child, where his boundaries are, that’s kind of a terrifying… what’s the extent, where does the room stop? Where are the walls? And also I think he’s really interested in what it means to be human, and that might well be love. I think he’s trying to work out what that is. Within the Marvel Cinematic Universe, this is very true. When we catch up with Vision in Captain America: Civil War, only about a year has passed since his creation, so he is still very much new to the world. Meanwhile, Wanda Maximoff has obviously been alive for 20-plus years, but it was only after the fall of S.H.I.E.L.D. and Hydra acquiring Loki’s staff that she was gifted her incredible abilities. Given how scary and crazy everything is in the life of an Avenger, it’s not a huge surprise that the characters would gravitate towards each other. Not only is the Vision/Scarlet Witch dynamic one of the best constructed in Captain America: Civil War, it’s also an exciting element just for fans who have been following the characters for years in the comics. Going back to the 1970s, the two heroes have long been romantically linked, and they’ve even gotten married and had a pair of twin boys (though the details behind how that worked wound up becoming incredibly complicated). The new movie does its part to send them down this path, and it spells exciting things for the future of the Marvel Cinematic Universe. Be sure to stay tuned for more from my interview with Paul Bettany and Chadwick Boseman, and get ready for Captain America: Civil War, which will be in theaters on May 6th.